For all of 2017, Julie of Paper Doll School, Boots of Popculture Looking Land and Miss Missy of Miss. Missy’s Paper Dolls and I have collaborated on a shared paper doll project. 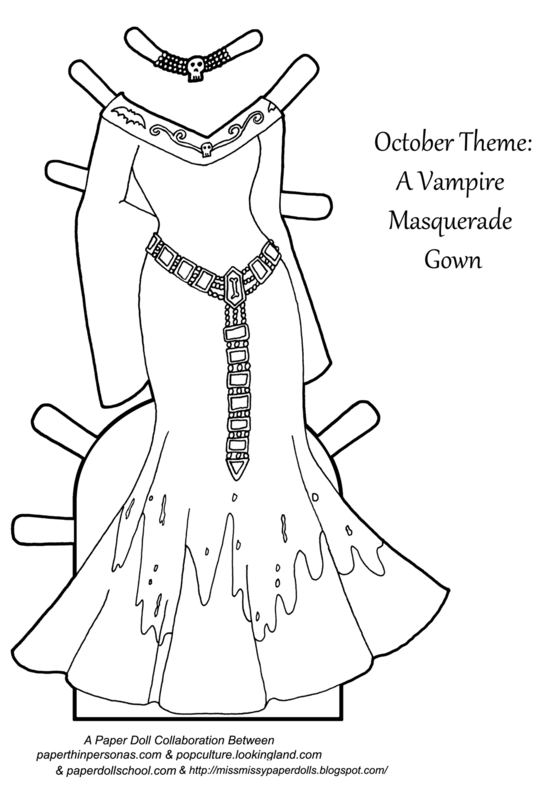 Each month we each post a paper doll outfit at the end of the month for a shared theme. So, I set to work to draw a very cliched gown. There’s even bats on it! And the dress is stained with blood which she says is fake. She might be lying. For those of you who haven’t seen all outfits from the Collaborative Paper Doll 2017 Project check them out here. And when you’ve got a change hit up Julie of Paper Doll School, Boots of Popculture Looking Land and Miss Missy of Miss. Missy’s Paper Dolls. They should be sharing their own versions of this month’s theme. I can’t wait to see what everyone came up with. Need the doll to wear this stylish outfit? Grab the Doll here. Love the belt! And there’s nothing wrong with something classic.